The agriculture extension worker was jolted when he went to Goandermoria village to distribute seeds to 350 households from 8 different villages on 5 January 2015. Unusually, 164 farmers who have been gratefully accepting free hybrid paddy seeds from him for the past six years declined to accept the seeds! The villagers also told him that they have taken the decision to cultivate their land only with local paddy seeds. Along with Goandermoria the 8 villages include Maloibari NK, 1. No. Oujari, 2 No. Oujari, Nijdimoria, Santipur, Bara Pahar & koikari respectively under Dimoria Block of Kamrup Distrct, Assam. The communities in these villages are agrarian & grow paddy for consumption and livelihood. Under the special agriculture support to local farmers, agriculture department has been doling out one kilogram hybrid seeds, freely, to farmers who often had to purchase more hybrid seeds from the market to cultivate their land. “We used to harvest 1000 kg rice per bigha (0.4 acre) on an average with the hybrid seeds given by agriculture department. We could thus earn Rs. 10000 with an investment of Rs. 5500 which includes the cost of seed. But over the years, the yield came down rapidly and the input cost shot up”, said Subal Das, one of the farmers who quit hybrid paddy cultivation. Alarmed by the diminishing profitability of paddy, farmers held several rounds of discussion in the meeting of farmers’ club which was formed under the FARM programme of Caritas India. They discovered that the cultivation of hybrid variety of paddy involved higher input costs as compared to the cultivation of local paddy varieties. Notwithstanding the rise in input cost, the returns from hybrid cultivation kept falling. “The average yield from one bigha of hybrid cultivated farm was 19 Mon (760 kgs) in 2013. But in the year 2014, it came down to 18 Mons (720 Kgs). The margin of profit was even lesser for farmers who used chemical fertilisers”, said Sanjit Das another farmer who boycotted hybrid varieties. One of the agenda of the meeting of farmers’ club was paddy cultivation and identification of local solutions for increasing the profitability of paddy cultivation. The farmers during their reflections also found that hybrid varieties required more water and pesticides as they were vulnerable to pest attacks. “The local paddy varieties could withstand water stress and even drought. Local varieties needed only 3-4 times of irrigation unlike the hybrid varieties which required 8-10 times. Apart from this, the local varieties were seldom hit by pest attacks”, said Subal Das. The farmers’ club found more justifications for quitting the cultivation of hybrid seeds. Most farmers had a holding of 4-5 bigha land and they could not manage with the 1kg free supply of hybrid seeds. Hence, they had to purchase seeds from market at exorbitant rates sometimes as high as Rs. 250 per kg. Local seeds, whereas, were available at a meagre Rs. 25 per kg even though close to 5kg was needed to cultivate one bigha farm. Thus the input costs of both hybrid and local varieties were constant at Rs. 5500 and the yield was more or less the same for both varieties. “We found in the cost-benefit analysis that the hybrid varieties were prone to more pest attacks and required more irrigation. The local varieties had a definite advantage – we could conserve seeds of local varieties. Whereas, we had to buy hybrid seeds from the market every year”, said Bolaram Nai another farmer who embraced cultivation of local paddy variety. The cultivation of local varieties had several other advantages. The yield of local varieties was rather constant regardless of the change in climate. “The taste of rice matters to us a lot. On that count, local paddy varieties scored very high over the hybrid paddy variety”, said Subal Das adding that the hybrid rice tasted rather bland. After several consultations, the farmers of Goandemoria to go back to the cultivation of local paddy varieties, which they had stopped cultivating six years back. Since the farmers did not have local variety seeds, they asked the agriculture department to supply local variety seeds instead of hybrid varieties. But the agriculture department, which has taken on itself the mission to popularise hybrid seeds, did not budge. “When the agriculture officer came to the village for distributing hybrid seeds, we informed him that 164 of us will not accept the hybrid seeds”, said Sapan Das another farmer who took the resolution to boycott hybrid seeds. The decision to cultivate local varieties has not only helped them economically, but socially as well. The farmers now meet frequently for identifying local seeds, collecting funds and procuring the seeds from nearby villages. “We do not want to depend upon the agriculture department any more. 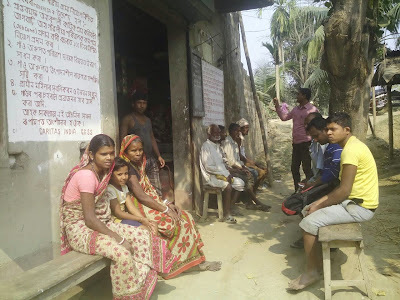 We are confident that the remaining families of the village will also follow the suit, and this will work harder to convince the Department of Agriculture to supply only local seeds”, Sapan Das added.